Probashbangla24 online Desk : Hindu devotees will celebrate Maha Ashtami at puja mandaps across the country on Wednesday as part of Durga Puja. 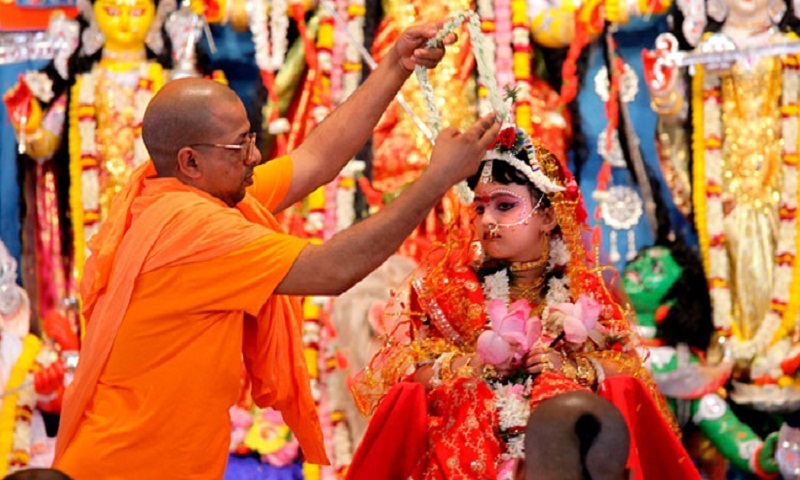 The main attraction of Maha Ashtami is Kumari Puja where a pre-pubescent girl is worshipped as “Mother Goddess”. Thousands of Hindu devotees will throng puja mandaps throughout the country to celebrate Kumari Puja. The celebrations mark the triumph of good over evil. The worshipped girl symbolises the power that regulates creation, stability and destruction on earth. The goddess is bathed symbolically and dressed for the final battle. It is believed that on this day, Durga killed the demon.